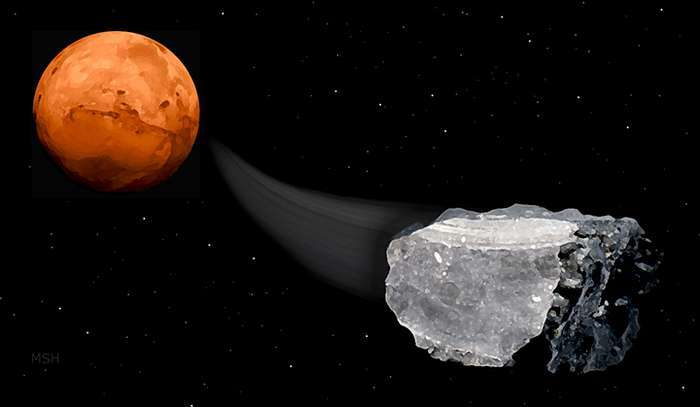 Scientists found methane gas in samples taken from Martian meteorites. Credit: Michael Helfenbein. An international team of researchers has discovered traces of methane in Martian meteorites, a possible clue in the search for life on the Red Planet. The researchers examined samples from six meteorites of volcanic rock that originated on Mars. The meteorites contain gases in the same proportion and with the same isotopic composition as the Martian atmosphere. All six samples also contained methane, which was measured by crushing the rocks and running the emerging gas through a mass spectrometer. The team also examined two non-Martian meteorites, which contained lesser amounts of methane. The discovery hints at the possibility that methane could be used as a food source by rudimentary forms of life beneath the Martian surface. On Earth, microbes do this in a range of environments. "Other researchers will be keen to replicate these findings using alternative measurement tools and techniques," said co-author Sean McMahon, a Yale University postdoctoral associate in the Department of Geology and Geophysics. "Our findings will likely be used by astrobiologists in models and experiments aimed at understanding whether life could survive below the surface of Mars today." The discovery was part of a joint research project led by the University of Aberdeen, in collaboration with the Scottish Universities Environmental Research Centre, the University of Glasgow, Brock University in Ontario, and the University of Western Ontario. "One of the most exciting developments in the exploration of Mars has been the suggestion of methane in the Martian atmosphere," said University of Aberdeen professor John Parnell, who directed the research. "Recent and forthcoming missions by NASA and the European Space Agency, respectively, are looking at this, however, it is so far unclear where the methane comes from, and even whether it is really there. However, our research provides a strong indication that rocks on Mars contain a large reservoir of methane." Co-author Nigel Blamey, of Brock University, said the team plans to expand its research by analyzing additional meteorites. Yale's McMahon noted that the team's approach may prove helpful in future Mars rover experiments. "Even if Martian methane does not directly feed microbes, it may signal the presence of a warm, wet, chemically reactive environment where life could thrive," McMahon said. Have we updated the Fossil Fuel definition yet? No, even though it is completely evident that the majority of the methane in the solar system is not derived from life. The final step in the process is catalyzed by the enzyme methyl-coenzyme M reductase. Methanogenesis is a form of anaerobic respiration used by organisms that occupy landfill, ruminants (e.g., cattle), and the guts of termites." "Methane could also be produced by a non-biological process called serpentinization[a] involving water, carbon dioxide, and the mineral olivine, which is known to be common on Mars." The gas giants and their moons have far more methane than Earth or Mars. Just take a look at Titan. That is immaterial to the question of where Mars's methane derives from. In the absence of active volcanism you would expect very little production at the current time. It could be fossil (clathrate ices), in which case you push the problem back towards a period of more actrive volcanism. But that is also the period when the surface of Mars was habitable. 1.Nigel J. F. Blamey, John Parnell, Sean McMahon, Darren F. Mark, Tim Tomkinson, Martin Lee, Jared Shivak, Matthew R. M. Izawa, Neil R. Banerjee, Roberta L. Flemming.